What is Aquatrols Fertilizer Coating Technology? Aquatrols Fertilizer Coating Technology utilizes the power of Aquatrols soil surfactants to maximize fertilizer performance. The surfactant coating moves water and nutrients into the soil more uniformly, ensuring better downward penetration and lateral distribution in the rootzone. This allows turf roots to more easily access and utilize nutrients, creating a healthier landscape that is better able to withstand stresses and retain visual quality for longer. Helps overcome the hurdle of naturally occurring water repellency, allowing water and fertilizer to penetrate quickly and distribute more evenly in the profile. 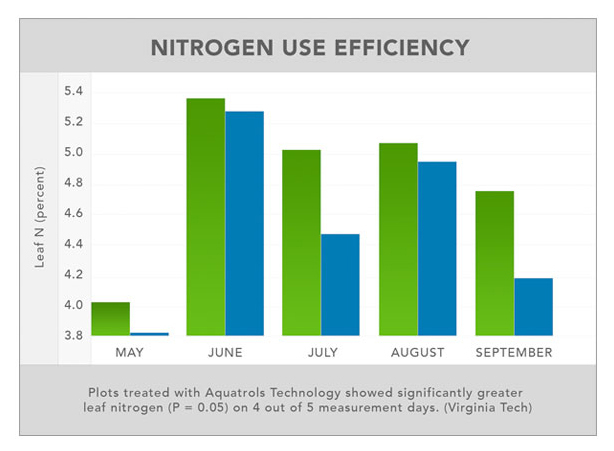 With water and nutrients delivered more effectively, plants are able to improve uptake, resulting in less product leaching and improved nitrogen use efficiency. Increases turf color and quality longer than traditional fertilizer formulations, even in stressful growing conditions. Provides a safe, value-added fertilizer formulation that is both affordable and easy to use. Contact your local Aquatrols distributor and ask about Aquatrols Fertilizer Coating Technology today. Fertilizer Coating Technology updates from Aquatrols!